Woolly mammoth exhibit at the Royal BC Museum, Victoria, British Columbia. : photo by Rob Pongsajapan on Flickr (use permitted with attribution). 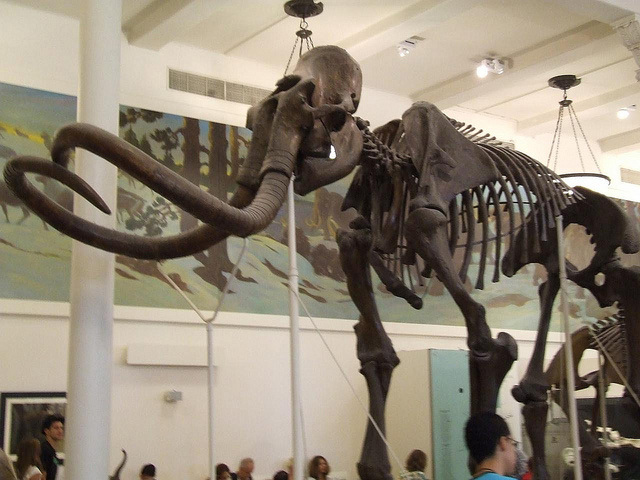 Nebraska designated the mammoth as the official state fossil in 1967. 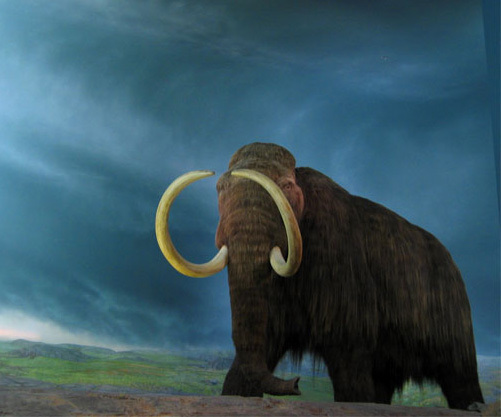 Various species of mammoth crossed the Bering Strait land bridge in prehistoric times and spread throughout most of North America. Giant grass-eaters of the Ice Age tundra, the woolly mammoth stood 10-12 feet (3-3.7 meters) tall at the shoulder and weighed 6-8 tons (5500-7300 kilograms), with massive curling tusks and long shaggy hair. Mammoth fossils have been found in most Nebraska counties. One mammoth found in Lincoln County (Archidiskodon imperator maibeni) was one of the world's largest elephant fossils (displayed in the University of Nebraska State Museum in Lincoln). 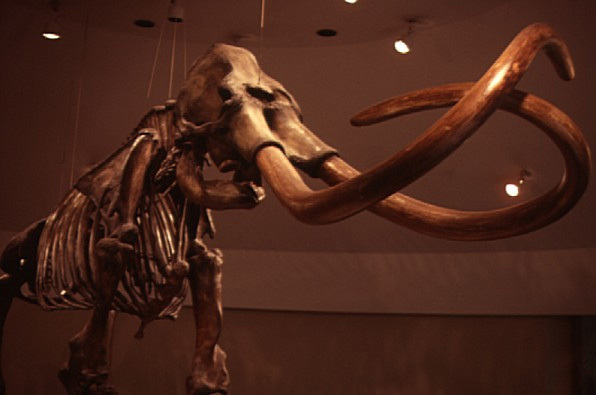 Alaska also designates the mammoth as a state symbol, and Michigan recognizes the giant mastodon. What's the difference between a mammoth and a mastodon? Mastodons had straighter tusks than the mammoth, and both the body and head of the mastodon is longer and squatter than the woolly mammoth (its back doesn't slope like a mammoth's). Woolly mammoth fossil at La Brea Tar Pits, California; photo © 1990 David Morgan-Mar: DM's Photo Gallery (all rights reserved; used by permission). Fossil model of woolly mammoth at the American Museum of Natural History; photo by Dan Stephenson on Flickr (noncommercial use permitted with attribution / share alike).